art commission, which will light up London Bridge, Cannon Street, Southwark, and Millennium Bridges in summer 2019. Following the granting of planning permissions, work will shortly commence on site, two years since the winning team was announced by Mayor Sadiq Khan. When complete, the free and publicly accessible light installation will span up to 15 central London bridges, from Albert Bridge in West London to Tower Bridge in the City, unifying them in a single artwork and defining them as a sculptural and symbolic link across the capital. The activation across the bridges will be phased, with a further section completing in 2020, and Illuminated River due to be fully delivered by 2022, subject to funding being secured. Celebrating the important role of the Thames’ bridges in connecting communities on the north and south sides of the river, this major art commission will enhance the public realm at night and create new opportunities for enjoyment and exploration of London’s riverside environments. Responding to social activity and built form on and around the river, the artwork will subtly unfold compositions of sequenced light patterns using dynamic colours and shifting hues inspired by the Thames paintings of Impressionist Masters and English Romantic artists. The unified lighting concept imagined by artist Leo Villareal refocuses attention on the Thames bridges, illuminating their separate identities and honouring the architectural and engineering heritage of each structure. Illuminated River’s energy-efficient LED technologies, smart networks and customised software will provide a long-term sustainable lighting solution for the bridges. Using networks of responsive LEDs, the project will cut down existing energy consumption and light pollution on the river including the reduction of light spill. 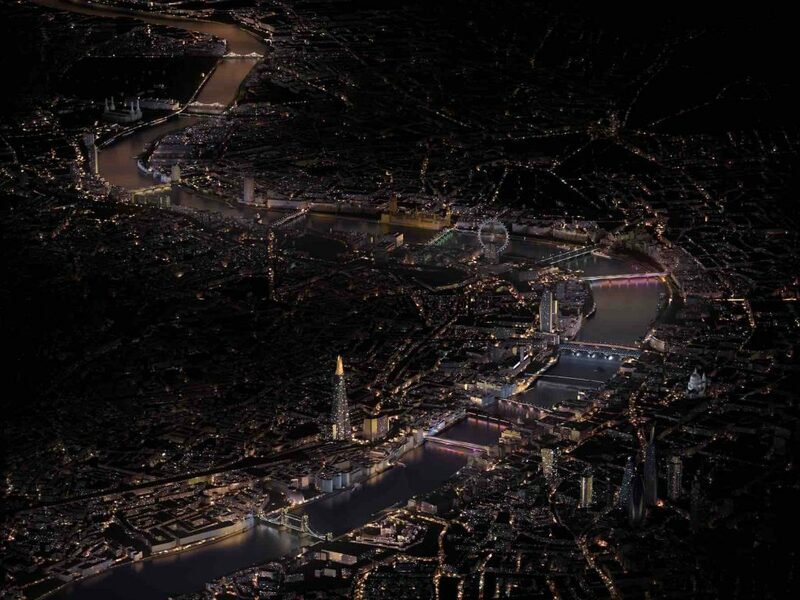 Illuminated River will provide an improved environment for the Thames flora and fauna, addressing the environmental impact of existing light pollution. The artwork offers a new river-focused London experience and promotes walkability and public safety along the Thames embankments. Illuminated River will enrich the experience of travelling along and across the river on foot, encouraging London’s residents and visitors to use the river – currently the city’s most under-used artery – as a means of transport. Illuminated River provides a best-practice model of collaborative urban practice, demonstrating how different sectors and boroughs can work together to support cultural initiatives that enhance public space, making the city more attractive and accessible for everyone. The competition-winning design team, led by acclaimed American artist Leo Villareal and award-winning British architecture practice Lifschutz Davidson Sandilands, was announced by London Mayor Sadiq Khan in December 2016. This entry was posted in NEWS and tagged Illuminated River, Leo Villareal, public art installation. Bookmark the permalink.